These contemporary Task Unity bench desks are built on a strong white frame and legs. They can be easily built into many configurations allowing greater workplace communication, but have an overall depth of 1600mm. In addition, they have full integral cable management with useful slide top access. 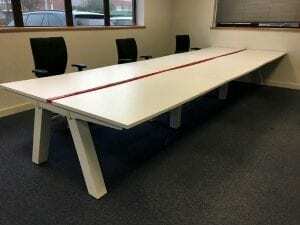 As always, you can view these bench desks in our showroom along with all our other used office furniture.